For photographic enthusiasts: All photographs and videos were taken with a Lumix FZ100. The RH&DR locomotives and track are scaled to ⅓ of a full size railway. Its lines may have a small gauge (15 inches) but it is a big railway with 13½ miles of track. Happy Passengers Inside an RHDR Carriage With Glazed Windows. The Royal Military Canal seen at the side of the line in Hythe. 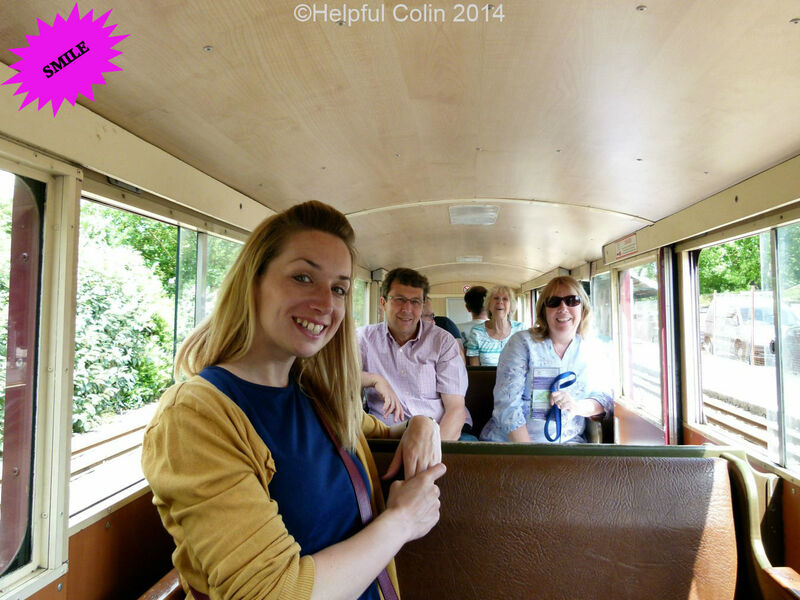 The journey from Hythe to New Romney wasn’t quite so bouncy as this video portrays. Because the line follows the Royal Military Canal it has similar bends in it which allow the loco to be seen from time to time. As you can see on the video below, of The Bug, we took our dogs a Border Collie and a Beagle with us on our journey from Hythe to New Romney. A locomotive sporting WW2 camouflage. Dymchurch is well known locally for this funfair which has been around for many years. It’s right at the beach, only a short walk from the RH&DR Station. Well it was late in the day by this time and a cool breeze had sprung up. So we were glad to get back on the next train to Hythe (the last train if I remember correctly). Go here to see more of My Railway Experiences.